Gloomy week here. Monday and Tuesday had foggy mornings; Wednesday, Thursday, and Friday were drippy, windy, and cold. The storm that affected the rest of the nation came through here, but, lucky for us, did not bring the ice and snow that paralyzed other areas. 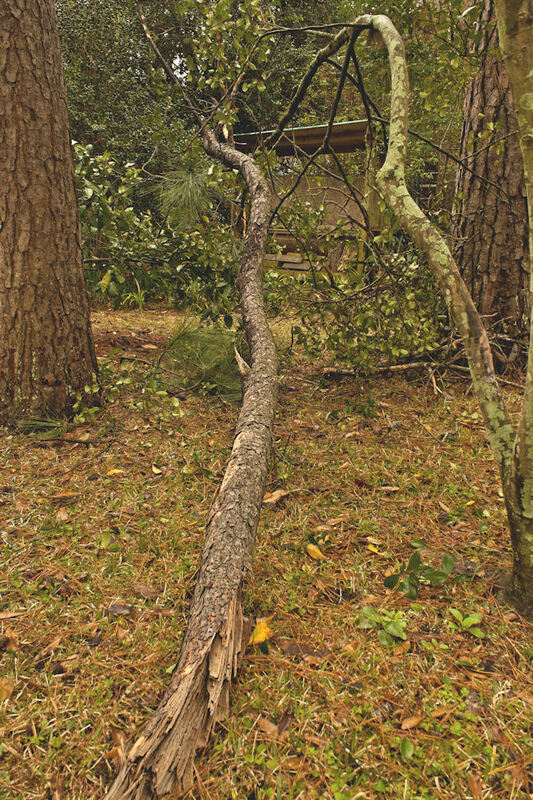 However, as it came through Wednesday, there were high winds that brought down a huge pine tree limb. Dear hubby was home at the time and said that when it hit it sounded as if a cannon had been shot in our back yard. This limb was 20 feet 5 inches long and 1 foot 5 inches in circumference. 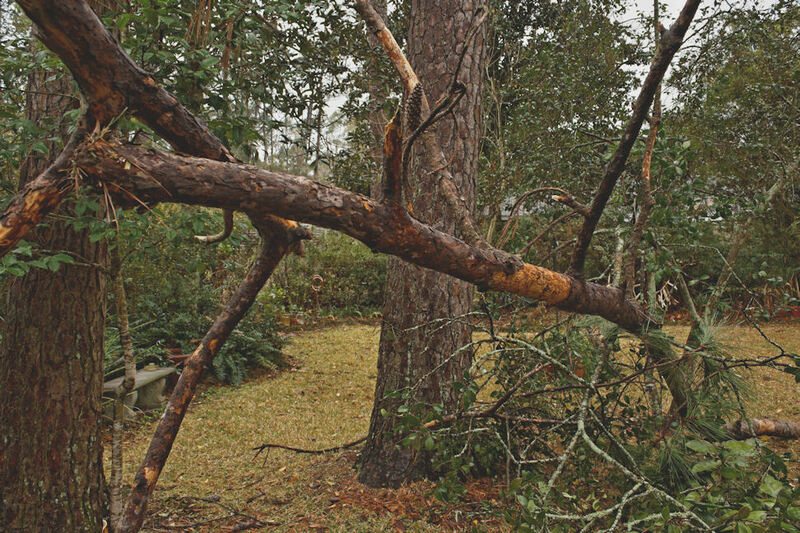 When it fell, it was deflected by a small magnolia fascata tree that sustained only minor damage. I was happy to see that the limb fell in the lawn and just barely missed the garden where hydrangeas are planted. I would have been very upset it any of those would have been hit since that would have meant no spring flowers. Today, the sun finally came out, and the temperatures have warmed up nicely. It is still too wet to go outside and work in the garden, but a cursory walk around the garden showed that there are many plants that are coming back to life. This just reinforces my wanting spring to come quickly. External hard drive problems have put my blogging on hold lately, but now everything seems to be up and running, so I am back to posting about the latest in my garden. 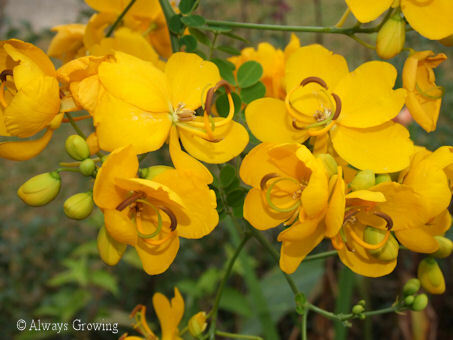 The show stopper right now is the cassia tree that is showing off its striking autumn gold flowers. 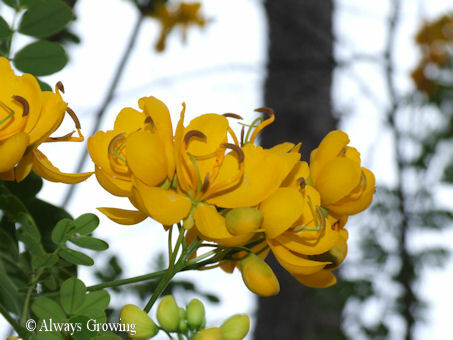 Cassia splendida is wonderful at this time of year especially if it is a cloudy day. These bright golden flowers really stand out then and enliven an otherwise dreary day. I certainly look forward to this small tree’s flowers every autumn. Another late comer. 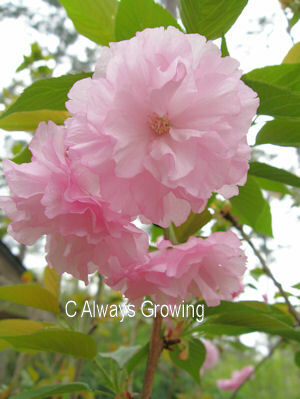 Lately, I have been posting about the “blooming later than normal” plants. Well, I have one more to add to that list. Our Cry-baby tree (Erythrina crista-galli) has started blooming. 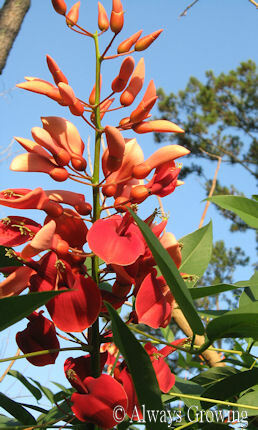 This plant sports huge spikes of deep coral-red blooms throughout the summer. 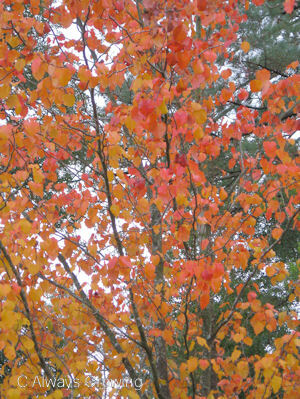 It is fast growing and, in our garden, quickly became a small tree. 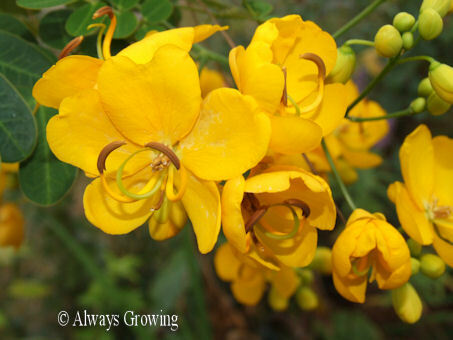 This plant is only hardy to zone 8, and, in my experience, it does get knocked back a bit in the winter, but quickly recovers to show off these wonderful flowers which attract hummingbirds. Hummers are not the only birds who like this tree. Every year there is a bird’s nest in this tree. Birds must like the thick foliage which hides the nest. I acquired my tree from a seedling given to me by a neighbor. Every summer when I see these gorgeous flowers, I am thankful for that neighbor’s generosity. 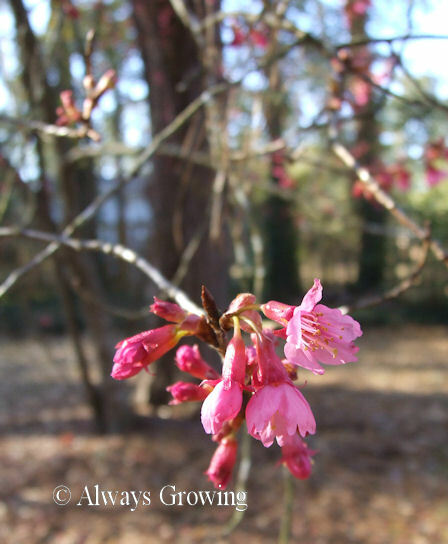 This is my third blogging spring, and my favorite flowering tree has just started blooming. 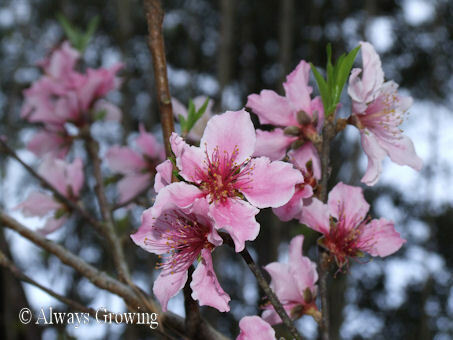 We planted two Kwansan cherry trees just after we moved here, and, while they are starting to show their ages, they still produce the prettiest pink flowers around. Whenever we have a cold winter, they seem to bloom better, so this year should be a great one for flowers. I am so happy that winter is gone and spring, with its accompanying rebirth, has become entrenched here. 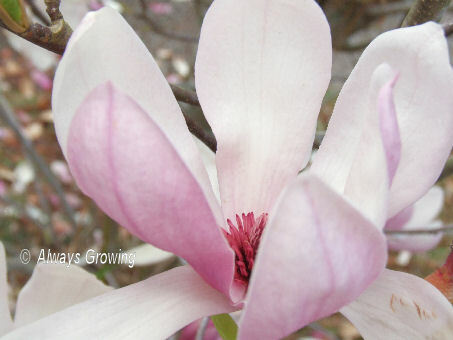 When we moved into this house, there already was a large magnolia tree growing on the property. The unfortunate part is it was planted about twelve feet from the front of the house and near the front entrance. 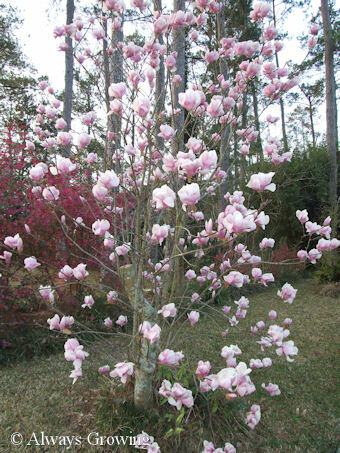 The magnolia is the quintessential tree of the South, and in the right spot is a lovely tree. It has so many things going for it. It is a tall stately tree which gives much needed shade during our hot summers. In spring time it has huge white flowers that are just so beautiful. It is just a wonderful, lovely tree. Many people admire it and want one. So, why do the people who own this big tree have a love/hate relationship with it? Well, it really depends where it is planted. Planted out in an open, sunny area where you do not care that there is no grass or flowers underneath, it is perfect. 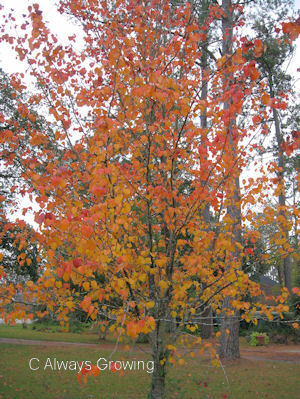 But so often it is planted near a house, walkway or driveway and that is when the trouble starts. First this tree is dropping something nine months out of the year. It starts in early spring with the old, big, leathery leaves falling. They fall for weeks. They can be raked up and three hours later, it looks like your yard hasn’t been raked in weeks. Case in point, the photo below is only four hours after I had raked up every leaf. About half way into leaf drop season, the flowers begin to open. This means the large papery bloom coverings fall off, then, as the flowers finish blooming, the big flower petals start falling. This is followed by a short break of not having to pick up anything. Then the seed pods begin to fall out the tree. While these are not large, they are hard as rocks so you have to be sure not to run over them with a lawn mower. Finally, the last thing to fall are the ripe seed pods with their glossy, bright red seeds showing. 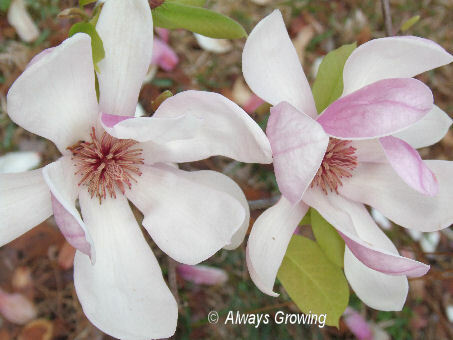 These aren’t too bad, but you have to watch for stray magnolia seedlings. All of these problems are made worse for us because of the tree’s placement. It is next to the house (leaves in the gutters), near the front entrance (have to keep raking up so house looks neat), and also, at the top of a circular driveway (large expanse of concrete makes leaves more visible). And, don’t even talk to me about surface roots. So since this is the height of leaf raking season for me, I have not been having too many good thoughts about our Magnolia tree. However, that did change last evening. A thunderstorm came through, and as hubby and I were looking out the front door at the rain, we both noticed a small white object bounce on the driveway. We both said at once, “Is that hail?” Yes, it was. Just as it started, I ran to the car that was parked in the open and moved it under the Magnolia tree. The big, leathery leaves protected the car enough so that there was no damage. Now, this morning, I have a slightly different opinion of that tree than I had when I took the picture of all the fallen leaves. We don’t often think of plants as being heroic, but we have a cherry tree that saved our house. During Hurricane Katrina, we had five big trees go down. Luckily, they all fell parallel to the house except one 150 foot pine tree, but even that tree missed the house because of our Kwansan cherry tree. It deflected the big pine tree just enough so that it missed the house and ended up just hitting the corner of a gutter. Unfortunately, the cherry tree was damaged, and had to be cut back. With everything going on and debris removal happening fast, the cherry tree was just cut back to about two and a half feet. It quickly started sprouting new growth, but was not very attractive. I wanted to cut it back to the ground and let one of the suckers take over, but dear hubby wanted to keep it and give it a chance. Kwansan cherry trees only live about twenty-five years, and ours is about thirty-two now. It has never really recovered from that falling pine tree. Every year it has fewer and fewer flowers with this year having the least. 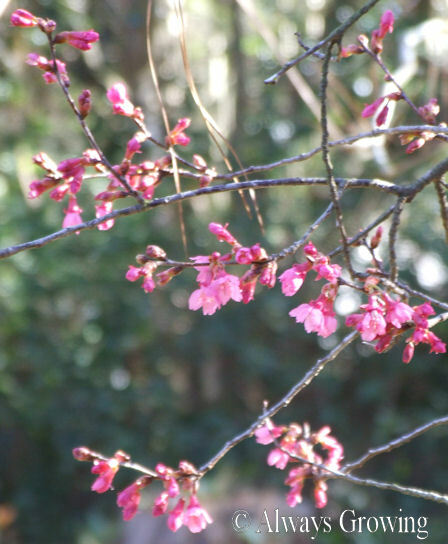 I think this will be the last spring this particular tree gives us these beautiful pink flowers. The little pink powder puff flowers that usually cover these trees are a welcome spring time addition, but I think it is time to say good bye to this particular heroic little tree. I know we can get a replacement tree for this area, but it just won’t be the same.